I learnt many new things on my first visit to Australia. That water drains anticlockwise Down Under. That Victorian refers not to nineteenth-century England but to the state of Victoria, of which Melbourne is the capital. 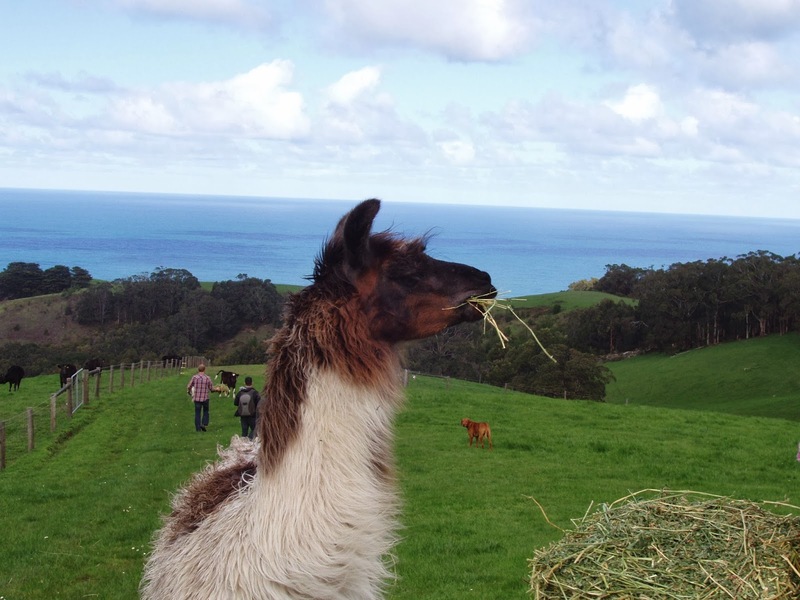 Also that Australia has llamas—and two days into my travels, I was standing face to face with one on a green meadow high above the ocean. The llama had a serene, supercilious face and her elegance was undiminished by the fact that sprigs of hay stuck out from her mouth. Early training from Tintin comics gave me the cosmopolitan ease with which to handle the situation: step back as if admiring the view before she can spray you with spittle. When I wondered at his choice of exotic pets, Steve Earle of Otway Farm told me the llama was a sheepdog in disguise. It chased away foxes, protected new-born lambs. It was a working member of his farm. My learning curve was going to get steeper: next I was told pigs are brainier than dogs. As tall, bearded Steve trilled “Dolores!” in an unexpectedly coquettish voice, a giant sow trundled across knee-deep mud to reach him, her emotional complexity obvious and moving. In that second, as Steve scratched her hairy ears, you could see how, in love, the homeliest of faces glows. Dolores and her colleague, Mildred, live on Steve’s farm to hunt out truffles. Truffles sell at about 2,000 Australian dollars, so Dolores and Mildred were about the most valuable staffers at Otway. At the Atlantic restaurant in Melbourne, when I ate chef Scott Pickett’s truffled chicken wings, savouring each smoky mouthful, I sent a silent note of thanks to Team Dolores. Melbourne showed me how, in a newish country where traditions hadn’t been inherited via centuries of transmission, it was possible to invent them with flair and imagination. The Melbourne Food and Wine Festival is on its way to becoming one of those traditions: invented only about twenty years ago, it now occupies a central place in Melbourne life. Any stranger I fell into conversation with eventually began telling me about it.